Directly south of the Strassenfest German Garden is the Floyd Pfautch Bavarian Garden, established in 2010. Bavaria is an alpine region that stretches across eight countries in south-central Europe. While the design of this garden is Bavarian in style, the plants are native to alpine regions around the world, including Europe, the Caucasus, and the Rocky Mountains. Alpine ecosystems occur above the tree line at high altitudes in mountainous areas worldwide. Alpine flora typically consists of dwarf shrubs, perennial grasses, sedges, and forbs. These plants have adapted to grow in areas with low temperatures, very low night temperatures, frost, a short growing season, high winds, and snow cover. The rock ledges, free draining soil and scree in this landscape mimic the conditions that alpine plants grow in helping us to grow a wider diversity of plants. Part of a Gardenwide effort highlighting the importance of plant conservation around the world, the Bavarian Garden is home to a diverse collection of alpine plants — many of them not seen elsewhere in the St. Louis region. Alpine plants are very challenging to grow in the St Louis climate due to the high summer temperatures, fluctuations of winter temperatures and high rainfall. As the Garden's horticulture staff experiments with various trial species and cultivation strategies, the Bavarian Garden will also host some plants that are not true alpine species. This approach will keep the garden looking great while horticulturists develop the right mix of plant life for the landscape. 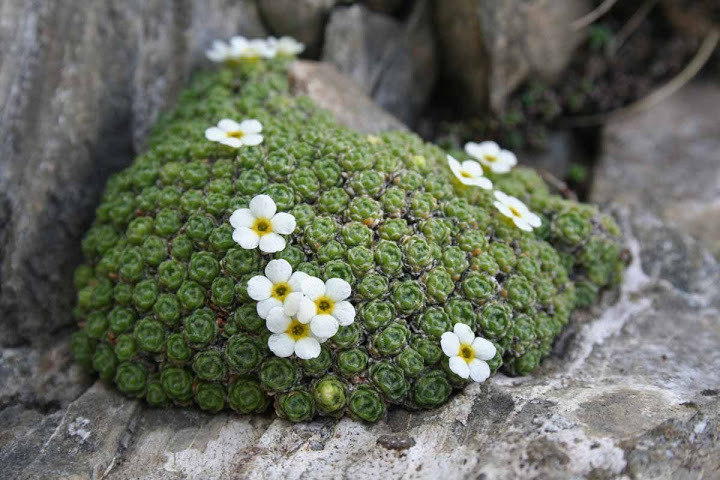 Alpine plants have adapted to the harsh environment in which they live, where many other living things would struggle to stay alive. Many plants are short, or even ground-hugging, to escape the strong winds. They tend to be evergreen, so they don’t need to develop new leaves each season and can begin photosynthesis sooner. Some have dense hairs on their stems and leaves to help moisture cling to them. Others have developed a waxy leaf surface to seal in moisture. Some plants even have red-colored pigments to help convert sunlight into heat. Alpine ecosystems are one of the most vulnerable ecosystems in the world. Alpine plants must move upwards in response to changes in precipitation and temperature, in order to retain the desirable climate conditions. Climate change has been associated with upward movement of some plant populations by 1-4 meters per decade at high elevations. Once species cannot move upwards anymore, they can be threatened with extinction. Alpines are also need a cool root run as many grow in areas of ice melt. As ice and snow have receded, soil temperatures are also affected. Help us study, preserve and display more diverse plant life by supporting the Garden's Living Collections program.